It’s the kind of call you never want to receive. My wife was out running errands, and I was home with our two little ones. Then the phone rang. Sara was hysterical. In the midst of her tears and screams, she managed to form the words that my oldest son Marshall had a seizure in the middle of class at school. She was frantically making her way to the school as paramedics, police and school staff rushed to my son’s side. As we’ve now pieced together, he was sitting in his desk at school working on an assignment when the teacher called his name. He sat staring and unresponsive as she continued trying to get his attention. Knowing this was out of character for him, she quickly went to his desk to see what was wrong. By God’s grace, she immediately realized that he was in the early stages of a seizure. As she laid him on the ground, the seizure intensified. Soon he was unconscious and convulsing in a room full of third graders. The school sprung into action to protect my precious little boy. And before my wife could arrive, they even took time to care for my daughter’s emotional needs as emergency personnel arrived for her brother. In an act of love and kindness, they ushered her to his side for a hug before his mommy was able to give one. Then with tears of concern, Marshall’s teacher updated my wife as she ran into the school. Meanwhile, I was frozen. My oldest daughter’s bus would arrive in 30 minutes, and I had no way to reach her. I was with my two young boys alone in the house, and needed to get to the school. I ran to a neighbor’s house, and without hesitation their teenage son offered to wait for my daughter’s bus. I loaded the boys in the van, and made my way to the school. As I sped toward the front of the building, a police car moved to make room for my giant van. I watched as my wife came crying from the ambulance parked just a few yards away. After a brief embrace, she rushed back to the ambulance and disappeared from view. As I turned away fighting back tears, I saw my youngest daughter Sophia. She was clinching the straps of her backpack, shuffling down the sidewalk sobbing. I gently guided her into the van with the boys, reassuring her as best as I could. All there was left to do now was wait for answers. Blood work. A CAT scan. vomiting. Dazed and groggy behavior. Another ambulance ride. The neurology wing of a children’s hospital. An overnight stay. An EEG. An EKG. A scheduled MRI. After all that, we have yet to determine the cause. As we’ve now learned, many people never discover why they had a seizure. All we know is that he won’t be able to climb trees for a while. Or swim alone. The odds of another seizure are dramatically increased, and the timing cannot be predicted. Life has changed, and the days and weeks ahead will be a bit scary. I don’t know how much to cry in front of my kids. I haven’t cried that hard in a long time. The last two days have been a battle between adrenaline and tears. Part of my job as a dad is to keep my other children calm and safe. I need to reassure them and answer their questions. But I simply don’t know how much they should see me overcome with emotion. They’ve seen a little. Most has been behind closed doors. Social media is overwhelming amazing. Within a few hours, my son was bathed in prayer around the world. Family, friends and strangers were praying for us in Minnesota, Illinois, Ohio, Pennsylvania, Tennessee, Turkey, New Zealand and more. Now more than ever, I’m grateful to God for Facebook. Watching kids process a crisis is heartbreaking. I’m so proud of my daughters. The little guys are too young to know what’s going on. But my girls showered me with the love of Jesus when I was too weak to make it alone. And my heart broke as I heard them processing what was happening to their brother. They asked, “Is Marshall going to die?” And, “I don’t know what I’d do without my brother.” They hardly slept they were so worried. When they sheepishly tiptoed downstairs early yesterday morning, Sophia asked, “When people die of seizures, do they die in their sleep?” They were restless until I could confirm that their brother was alive and well in his hospital room. Relationships with neighbors matter. I’ve only lived in Ohio for about two months. Sara and I have been overjoyed to see people on our block welcome us onto their street, and into their lives. Without much effort on our part, women from MOPS and Bible Study Fellowship have showered my wife with love and support. New colleagues stopped their lives to help and pray. We wouldn’t have made it without these precious people. Jesus modeled the importance of community. The book of Acts is overflowing with illustrations of the value of life lived with others. Those lessons have renewed significance for me. We’re relieved to finally have Marshall back home with us. Words cannot express the gratefulness we feel to those of you who lifted us up in prayer when we needed it most. We praise God for his mercy and peace in the midst of our fears and panic. Most of all, we cling tightly to the blessing of a community stretching across great distances that carried us through a crisis. Brian: So thankful for God’s watch care over, not only Marshall, but your whole family. Thanks for your transparency, and may the LORD continue to be near. Brian – I’m SO glad he’s alright. Reading this brought back vivid memories of Raphael’s 4 day coma at age 2 1/2 that started with seizures. It also reminded me of the miraculous intervention of God through it all. He’s 18 now and I frequently remember almost losing him. The memory feels like yesterday even though now he’s 18. You and Sara are a great team and I ‘m so glad Marshall’s ok – maybe one day, he will beat me at Super Smash Brothers again – and I’ll be just fine with it! Brian, thank you for being so candid about your family’s experiences over the last 48+ hours. All of the pieces were in place: a teacher who sensed something was wrong and sprung into action, sensitive first-responders, parents who were in close proximity to reach their son, a caring, available neighbor, a top-notch medical facility specializing in child healthcare, a close-knit family, and last but not least, a broad prayer chain showering your son and family with intentional prayers. As believers, we know that these were not coincidences! Fear, uncertainty, and weariness might creep in, but isn’t it comforting to know that, above all, your son Marshall is under the care of the Great Physician! Well said Judy! Thanks so much! I just read your very personal and scary post regarding Marshall. I wanted to reach out and let you know that I will keep your family and Marshall in my thoughts and prayers. Reading your post was especially emotional for me because I can relate to what your family is going through right now because it happened to my younger sister, too. It is the scariest thing I have every witnessed in my life and you don’t wish it on anyone to have to see happen. Marshall is lucky to have a very compassionate and caring teacher and is loved by so many people. About 11 years ago, my younger sister, Rachel and I were getting our nails done and had our car all packed up to drive out to Chicago to look for places to live. We were so excited and smiling, relaxing and chatting, when all of a sudden, I looked over at my sister, who was sitting and getting her nails done at the table right next to me and was leaning down under the table, shaking. I remember thinking what is my sister doing…her head began slowly lowering from underneath the table, she was bobbing back and forth and before I knew it…she was laying on the floor, convulsing, foaming at the mouth, turning different shades of purple, blue and green and her eyes were rolling in the back of her head. All I could think of at that time, was that my sister was dying…I am her big sister and I am supposed to be protecting her and there is nothing I can do, except scream out for help, and cry out for my sister. Everyone at the nail salon, both the employees and customers, all jumped up right away to rush to me and my sister’s side and call 911. Thankfully, there was a nurse who happened to be in salon and she came over right away and explained to me that my sister was having a seizure. Again, I had never seen this happen to anyone before, so I was scared and had no idea what was happening to my best friend. 911 arrived, she was taken to the hospital and for several hours, admitted for testing. It sounds like all the different medical tests and procedures they did for Marshall, also occurred at the hospital for my sister. 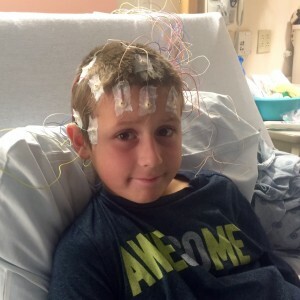 Once my parents arrived at the hospital, too, the doctor’s explained to us that my sister had a grand-mal seizure, but they did not know what caused it to happen. So, my parents decided to take my sister to see a specialist the very next day for further evaluation. My sister was placed on medication for seizures but unfortunately, this medication did not work. A few month later, my sister had another seizure. My family and I believe that an angel must have been looking down on my sister when her 2nd seizure took place, because this time, she was not sitting at a nail salon, but actually driving her car, alone. The doctors decided to change the medication they placed her on and after a few different trial medications, one finally started working and the seizures got less severe, and at this moment, have stopped all together. Fingers crossed! I guess what my lesson is here, is that yes, it is amazing at how many people can come together from all over the world to show your their love and support and offer their prayer, however, it is always best to get another medical opinion, just to be on the safe side. I pray that this was just a one time thing for Marshall and that no one knows why it happened, but please make sure to have him further evaluated. Thanks so much for sharing your story, and your wisdom Katrina! I pray that your sister’s seizures are gone for good, and that Marshall’s are as well. We miss everyone at CVCS, and are so grateful for your continued love and support. Thanks! I am grateful for the community of people who came around you in your time of need. Thank you for sharing this incredibly difficult situation and how you’re processing it. My prayers are with your family. Thanks my friend! We’re grateful for your kind words and support. Continue to trust in the LORD for he will see you through this. My love and prayers to all of you. Thanks so much for your prayers, and for sharing your personal story. It’s been so comforting to hear from others who have been through similar situations. Thank you! Praise the Lord that Marshall and family are doing well. Thanks for sharing your story. I am sure writing this was not easy. Thanks Stephanie! Truly my pleasure.